Yoga Butterfly Asana (pose), just like Hatha Yoga Back Stretching Pose, is recommended by kundalini yoga as an exercise that should be an integral part of your daily yoga practice. 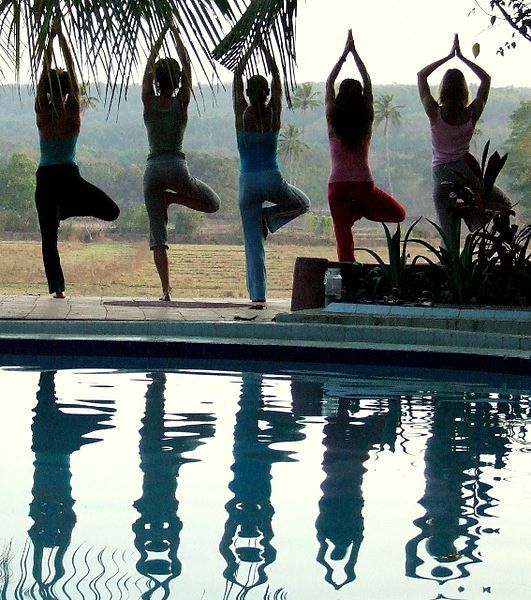 As this pose is part of both hatha yoga and kundalini yoga, it is part of both e-books, Free Online Hatha Yoga Poses Galleries and the Free Illustrated Kundalini Yoga Poses E-Book. Butterfly Pose, or Pooran Titali Asana, is how I always start my yoga practice. I remember doing this pose way back in high school during tennis warm-ups. I liked it back then and I still like it now. This asana not only works to raise the frequency of your sexual energy, so that it can be used to enrich the higher centers, but it also promotes flexibility in the all important groin region and hips. Us marathon meditators, understand well the importance of flexibility in these regions, as that helps us sit for long periods of time. In fact, if there was one asana I was asked to recommend to help yogis sit in meditation, it would be Pooran Titali Asana. Below you will find some illustrations of this simple yoga asana. I have shown two variations for the hand position and there are also two variations of how this stretch can be done, which I discuss in the practice section below. Sit up straight and bring the soles of your feet together in front of you. Wrap your fingers around your toes (illustration #1) and gently pull your heels in towards your groin. Keeping your back straight, lean forward from the waist as far as comfortable. You should feel a good stretch in your groin region. Use your elbows as levers to push down on your calves or inner thighs. You may do this stretch with the Breath of Fire or with Long Deep Breathing. Excellent yoga asana to improve the flexibility in the groin and hips region. Both important regions for helping to sit in meditation. This asana transmutes sexual energy into higher frequencies, allowing it to be used to nourish and heal the higher chakra points. For more information on chakras you can read Kundalini Seven Chakra System Overview). A hand position variation you can use for this asana is shown in illustration #2. Here I wrap my hands around my ankles instead. This technique can sometimes provide a more intense stretch. Also, notice in illustration #2, how I am using my elbows to accentuate the stretch by pressing down on my inner thighs. Another variation to how this asana can be practiced, is by bouncing your knees gently (like a butterfly flapping it’s wings), instead of holding the stretch steadily. In this variation, make sure you don’t force the legs too much. To assist in this variation you can also hold your knees and press down gently on the downward stroke. This technique, helps open up the hips more. As the end of this asana, you can inhale deeply, hold your breath and apply root lock (or mula bandha) to help redirect the energy back into the spinal cord. 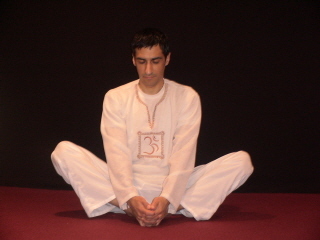 Root lock is described in the following article: Raja Yoga Set for Awakening Kundalini Shakti. Great site you have here. Thanks for the tips. they are indeed very helpful in my yoga practice. This is great to remove stiffness with age. Once practiced and loosened the legs it is a lovely relaxing position. 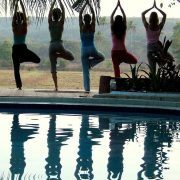 hi i am a beginer of yoga n like to have improvement in yoga i hope this web site will be helpful to me.. I love this pose and begin anything with it too. IN breath of fire pranayam should we contract the abdomen or expand it? When i try to do Butterfly Yoga Asana, my knees and thighs touches the ground, but i can pull my heels towards my groin. I am not able to hold my legs correctly as shown in the picture. Is that ok ? Then, i am enjoying all the articles and the lessons. This is the first posture I start my yoga sets with as well (the other good starting exercises are the spinal warm-up series). I do butterfly pose as my first seating posture. I really gives the impetus for other sitting postures. Thanks for the inspiration. I am doing butterfly while typing and I needed it.